Discussion in 'Videos' started by FuminoAya, Apr 15, 2019 at 1:08 PM. Hell lies within a person. MSdrawman, Carney, CerealnOats and 6 others like this. Funny alliance comment at the end "anyone familiar with dits?" "Did you know that level 200s are 1% of the userbase, yet they have 99% of the levels?" Do you think shads need more changes? Considering shads have to keep up with 2 'weapons'. And thank you for the video! More bosses please! And thank you for the video! More please bosses please! I think Shadowers are in a really good position now. We don't neccessarily need Sharp Eyes to boss. Sure you benefit from it too, but it's not like we're entirely useless once the BM / MM dc's or dies at bosses. We have amazing single target DPS, and even greater multi target DPS. We don't need to bomb mesos at all at bosses to compete with other classes, however when we do, our DPS skyrockets. i mean i did about 11m / damage per minute in this shaolin boss run. and my gear isn't even perfect yet, or close to somewhat decent. my range was about 8k clean with MW20 there in the video. it's certainly possible to reach 12k at lvl 200 with proper gear. Solo bossing is fun since i don't have to bring my goddamn SE mule to EVERY single boss i do, i mean when i duo Shaolin with other people ( who aren't NLs ) i don't even bother to bring her since she's just not neccessary. i can just play my >>1<< Main Character, which is my Shadower im having lots of fun with. 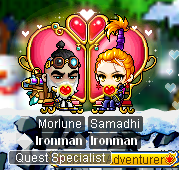 Conclusion: No need to drop mesos & become poor, but the option is still available for some quality time at bosses lol. And for the more videos, yeah i wanted to go solo Scarlion & Targa today but i then realized i had to have 3 people for the expedition, thus i tried to go duo with a lvl 148 Paladin with about 6.2k range to Scarlion & Targa at the same time with apple & bombing them (On a sidenote, they have 600m HP combined and a 30 minute time limit). Im pretty sure we could've done it, however when i tried to enter the boss map i got ported back to town, so that'll have to wait until the bug is fixed haha. camello, Chien and Crazzzzeh like this. I saw the video by Heli and Luna soloing pap pre buffs, it'd be interesting to see one post buff! low key wanna sell my claw for a dagger lmao.